Philippines-based company which produces the best-selling Emperador brandy, and also owns Whyte & Mackay. Emerador Distilleries is one of three companies within the Alliance Global Group, headed by Dr Andrew Tan, a self-made Chinese Filipino billionaire whose business interests embrace not only drinks but also real estate and fast food. Emperador is now the world’s best-selling brandy, retailing 400 million bottles in Asia during 2013. The company owns the renowned Bodega San Bruno in Jerez, Spain and vineyards in Toledo. With the acquisition of the Bodega came a significant quantity of brandy that is maturing in ex-Sherry casks. In Scotland, Emperador owns Glasgow-based Whyte & Mackay, which operates Dalmore, Fettercairn, Jura and Tamnavulin malt distilleries, along with Invergordon grain distillery, and produces Whyte & Mackay blended Scotch whiskies and the Glayva liqueur. Andrew Tan launched Emperador brandy in 1990, at a time when gin and rum were the most popular spirits in the Philippines, and its image is of a vibrant, aspirational drink for younger consumers. Emperador Light was introduced in 2010, followed three years later by Emperador Deluxe, which helped establish the company as a global player in the premium spirits sector. The same year, Emperador acquired The Bodega San Bruno from González Byass, and the San Bruno brandy trademark, registered in 1942. 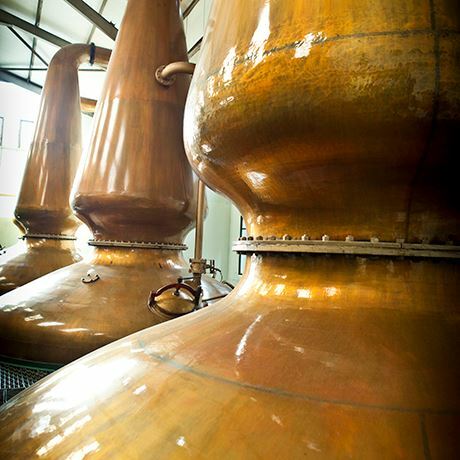 November 2014 saw the completion of a £430 million deal between Emperador and United Spirits of India for Whyte & Mackay Distillers, with the sale being forced by the UK Competition and Markets Authority after Diageo bought into United Spirits.